- Polyester iron on self-adhesive film. Weight 65-85 g.s.m. - Stiffer and stronger than Solarfilm. Has a glossy finish. Resists all fuels including diesel and petrol. Has less shrinkage than Solarfilm so not as easy to apply. MODEL TYPE: All types of R/C models. 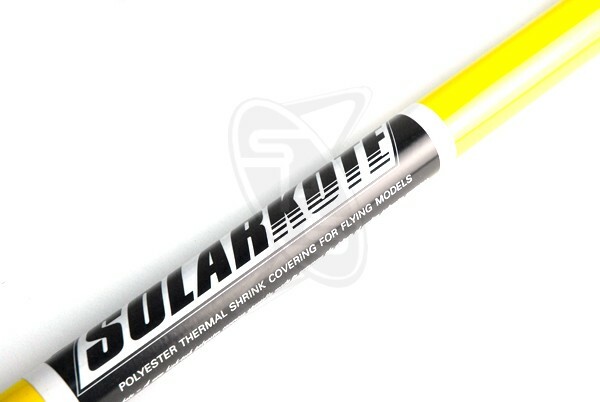 On open frame models, Solarkote covering adds more stiffness than Solarfilm. APPLICATION: Iron on. Needs more heat than Solarfilm. But safe on foam veneer if care is taken with the iron setting. Can be painted with Solarlac or trimmed with Solartrim.